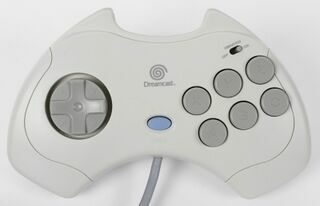 The ASCII Pad FT is a special Sega Dreamcast controller manufactured by ASCII and only released in Japan. The "FT" stands for "Fighting Type". The ASCII Pad FT is somewhat of a step backwards in terms of controllers, as it resembles a standard Sega Saturn Control Pad, dropping the analogue stick completely and replacing the L and R shoulder buttons with C and Z face buttons. It was built with 2D fighting games in mind, similar to the Dreamcast Arcade Stick, though is much smaller and has a switch to enable rumble features. It can also hold one VMU. There are several types of ASCII Pad FTs, including the standard white edition, a black "Capcom" version and a blue "SNK" version. There is also a transparent-black version of the controller. There is also a ASCII Stick FT, which resembles an arcade stick. An "ASCII Pad FT2" peripheral with similar functions was later released for the PlayStation 2.